Would you rather see a trust based system be per NPC or Global? Poll closed Mar 31, 2019 . I'd like to introduce a game I am working on just to see what everyone thinks as it is a passion project in my head for years and now I'm finally getting around to possibly bring it to fruition. So without further ado here is Pokemon Elect! The concept is simple in thought but far more complex in realization: To change standard Pokemon games to allow them to feel more like a personalized RPG rather than just a generic top-down premade storybook. So as a result you will get to CHOOSE everything that happens in your journey. Catching your first starter Pokemon from one of 36 possible choices! Choosing 1 of many various professions. Said professions each have pros and cons to them and have their own customized dialogue/actions throughout the game. Scaled profession challenges meaning you can explore the map in any way/order you like in its' entirety. You can change professions at any time. I wanted to give a bit more information about professions and what they are. Professions are how you come to be known in the Pokemon world. You can be a variety of professions such as a Pokemon Trainer, a Pokemon Doctor, a Breeder, a Police Officer, a Pokemon Thief, etc. Said professions will each have a rank completely unique to them and you are free to change professions at any time during your journey. However rank progress does not carry over to NEW professions. This means if you're a rank 4 Trainer and you want to switch to being an Officer you will go back to rank 1. If you do go back to a previous profession it will revert to whatever your rank was at its' highest for that specific profession. This means in the above example that if you got to rank 6 as an Officer and then swapped back to Trainer you would be at rank 4. Your professions impact how the world around you will treat you. This means things like if you are a Doctor instead of battling you on a route Trainers may ask for your help in healing their Pokemon through various ways. If you're a high ranking Thief, Officers in the world may attack you on site prompting a battle which if lost means BIG trouble for you. If you're a renowned Breeder NPCs may ask for your aid in getting a certain result of pokemon, etc. The NPCs in the world will ALSO have professions of their own and your profession may align or misalign with theirs. If so they may make comments of it or trust will be gained less easily with them. (Doctors for example don't really trust Trainers due to them constantly putting their Pokemon in harm's way without much hesitation, though they still happily help trainers regardless). The higher your rank is on a certain profession the more the world around you will recognize you for said profession and the more profession-related concepts will pop up. Once you get your rank up high enough you qualify for the Master Rank challenge in each respective profession. To relate this in normal terms the Pokemon Trainer's Master Challenge is to beat the Elite 4 BUT in this game the E4 actually live up to their naming being 4 of the most elite Trainers in the region. "Pokemon Centers? Pfft not for a Master Healer, you have the ability to heal your entire party anytime, any place. Additionally you have FULL access to all healing items in the game at a 100% discount from the store as a sponsor for you to use throughout the region as you heal others." This game is in VERY early stages but I am currently working towards getting a demo up to the end of your First profession challenge for a small selection of professions just as a trial run. If you have any thoughts, questions, comments, desires to help, etc. Please let me know in the comments below! More info will be released as I continue development! In short these complexities build upon each other. So everything a simple NPC has, a Medium complexity one will also have in addition to other features. Simple NPC's are the most basic unit that will make up the NPC's unrelated to special events. These NPC's will offer a large variety of dialogue and interactions (think sidequests, gifts, trade opportunities, etc.) with you based on trust that you have built up in the local area. The higher your trust the more unique and special interactions you get. There are 5 major levels of trust with each level having multiple dialogue points that could be brought up under varying conditions. Medium NPC's will also offer you unique dialogue and options based on your trust. However, in addition to those trust based options they also will start to take opinion on your profession and your rank within said profession. For example, if you are a thief a medium NPC who is a cop will show their dislike with you and have certain ramifications based on criteria met through your profession and tasks related to that. Medium NPC's will have unique profession-based interactions for anywhere between 1-3 different professions per NPC. Complex NPC's are the big one guys. These are some very special NPC's. Each area will have at LEAST one complex NPC on it. Complex NPC's are rightfully so because they do everything medium NPC's do and then some. They not only offer that unique profession-based interaction but they are coded to have interactions and opinions on EVERY Profession in the game as well as various other unique circumstances you may come across. They have massive amounts of dialogue behind them (Each complex NPC has a minimum of about 2500 lines of code in their event). These will also be the toughest NPC's to bond with but offer the greatest reward for getting to know. They have a built in system that will give you various RARE rewards for exploring all of that complex NPC's options. I.e. if the more you talk to these people and see all the various dialogue they have to offer you and build your relationship with them uniquely the more they will work with you and reward you with things. These 3 categories will make up all the NPC's in the game and the foundation for all of these have been fully built and are simple to work with. The biggest barrier I have left is finishing up the Complex NPC's in the demo, there are set to be 5 Complex ones in said demo and only 1 has been made fully so far. Bear with me on this as these guys do take a large amount of time to build as they are extremely unique people. Your adventure awaits you in this large open-world region. 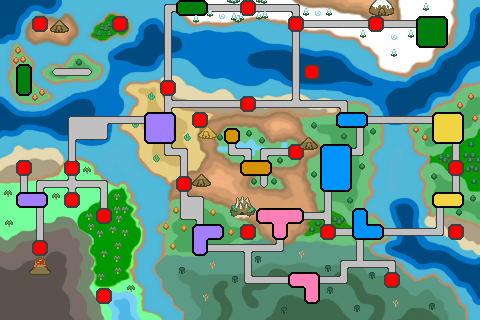 It is approximately 150% the size of the Johto region and offers you access to 5 very large cities, 10 unique and special towns, over 22 unique dungeons (think caves, forests, etc. ), and over 30 routes. The terrain varies and you will have many tools at your disposal to completely traverses this sprawling terrain. Best part? Once the main game hits you will be able to go anywhere and do anything in whatever order pleases you. The world will completely scale around you so feel free to explore at your pace, your way! Again we are currently still playing around with these as well as getting stories made for each of them and if something doesn't pan out the way we envision something is subject to being scrapped. However, due to this we are also constantly on the prowl for other good unique profession ideas. The main one I do want to unfortunately dispell is Coordinator/Contest Participant, it just seemed to come across as too repetitive and there weren't many unique things we could do with it majorly. If anything else comes to your guys' minds though or you have questions about any of this so far please let me know! We have several people hard at work at getting this built for everyone to be able to try out and we want this game to fulfill its' vision which is to build a Pokemon experience and story that feels unique and is something each person gets to choose and build for themselves. So if there is anything that you are curious or have questions or want to see always feel free to let me know as we genuinely have you all in mind while we are building this! This is a really interesting concept, but ambitious. It sounds like a lot of complex eventing and scripting. Do you have much experience in that realm? Scripting and coding events is like the one thing in essentials I feel genuinely comfortable on! I am still attempting to scramble together figuring out how to map properly and I am next to useless at spriting and music but am trying to pickup the skills needed for it. But in short yes I did software coding and such for a number of years so script-wise I think I should have that covered! No this looks very ambitious and have the feel of what could become a great RPG. I would love to play it. I'm glad the concept intrigues you! I have ALOT of inspiration in my head of what I'd like to do with this game, for now it's just a matter of working through scripts and events for the first demo to see how it comes together a bit. I am hoping to have the demo complete in a few weeks give or take! This sounds like a FanGame where I can finally take a different occupation than the standard Trainer and explore other things than Pokemon Battles. +Watch, looking forward for news and updates!~ Great to hear that your head's full of ideas and inspiration. Nice! I wish you tons of inspiration, dude. Go get them! Thanks so much for the support! Yes you will have many different interactions with the various professions. The goal is to make everything a choice for you with each choice boosting or taking away from the various professions. (I.e. as a Doctor you will be presented with healing situations but also may have the option to battle but choosing to battle will take away from your profession since you are hurting the Pokemon or vice versa) but you can elect to do whatever your heart pleases! I hope this game actually gets released. I'm liking the concepts of the various professions.